Stock news this week: Harvey knocks out America's refineries; NAFTA talks end; Kroger and Barnes & Noble reports earnings. 1. Harvey knocks out America's refineries: As the skies clear in Texas and Louisiana, Americans are left to assess the damage done by one of the most -- if not the most -- expensive natural disasters in U.S. history. The storm served a blow to America's energy hub. Several key refineries and production facilities closed, including the two largest in the country. 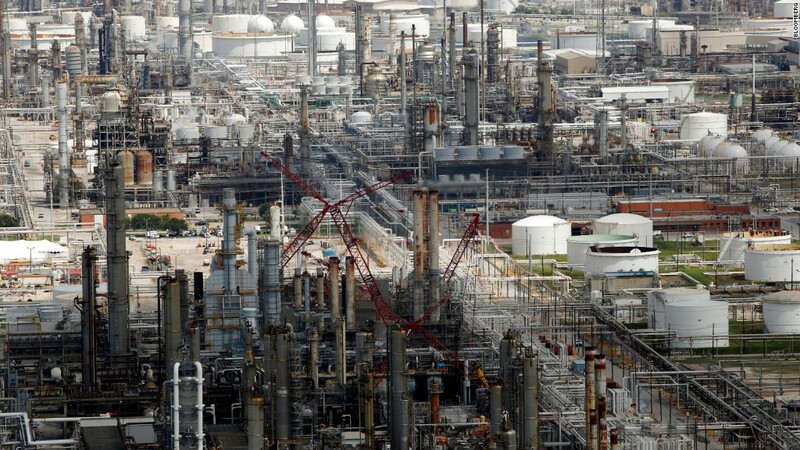 Flooding at Gulf Coast refineries impacted nearly 30% of the nation's overall refining capacity. The closures have caused gas prices to jump: the national average price for a gallon of regular spiked about 27 cents to $2.62 per gallon since Harvey hit Texas. Gas futures rose by more than 10% on Thursday, and fell slightly on Friday -- suggesting that traders think the higher prices won't last. It's not clear how long it will take the refineries to reopen, and some analysts fear it will be weeks before they're back on track. 2. Second round of NAFTA talks end: The second round of NAFTA renegotiations began on Friday in Mexico City and will end on Tuesday. The first round of talks took place last month in Washington. Representatives from the United States, Mexico and Canada all said that they want to move quickly -- but that doesn't mean they were all on the same page. While Mexican and Canadian leaders said they're interested in "modernizing" the agreement, the United States wants significant changes. Specifically, it's hoping to remove a key (but controversial) chapter which protects companies' investments abroad, and raise the bar on the amount of U.S. product parts. About 14 million American jobs depend on trade with Mexico and Canada, and billions of dollars of goods cross the borders every day. 3. Kroger reports earnings: Grocery chain Kroger (KR) will report its second-quarter earnings on Friday. Kroger's stock plunged in June after it warned that its earnings for the full year would be lower than Wall Street expected. That's not surprising, considering how the grocery competition is heating up. European supermarket chains Aldi and Lidi are planning to open up stores in the United States, and Walmart (WMT), Costco (COST) and Amazon (AMZN) remain fierce competitors, especially since Amazon bought Whole Foods and started lowering prices. 4. Barnes & Noble reports earnings: Barnes & Noble (BKS) will report earnings for the first quarter of fiscal year 2018 on Thursday. It's been a bleak time for retailers: Department stores are losing customers and traditional retailers continue to close locations. Barnes & Noble has suffered in recent years, thanks in large part to Amazon -- which lured shoppers away from brick and mortar stores, and then started opening physical bookstores itself. 5. North Korea carries out nuclear test: On Sunday, North Korea carried out its most powerful nuclear test to date. Pyongyang said it has developed an advanced hydrogen bomb that could sit atop an intercontinental ballistic missile. If that's the case, North Korea would be closer to being able to fire a nuclear warhead to the U.S. mainland. The markets were closed when tremors were detected, but have dipped since the news, and we may see a reaction when they reopen. Stocks fell after North Korea flew a missile over Japan last week.